it’s an Intermediate Bulk Container, or (IBC); a reusable container used to store bulk liquid or granulated substances. Most IBCs are conveniently housed in a tubular, galvanized cage, often mounted on a pallet for forklift or pallet jack transport. These large cubes can store up to 330 gallons, providing far more storage capacity than their counterpart, the 55 gallon drum. IBCs can be warehoused in any type of pallet storage medium, from bulk stacking, to pallet rack, to push-back, and of course, pallet flow. All work, but pallet flow is the only option that offers dense storage, SKU selectivity by lane and first-in, first-out (FIFO) inventory rotation, critical for raw material storage. Food items such as cooking oils, egg whites, sauces, dressings, and baking ingredients are under strict FDA guidelines for stock rotation and traceability. Take a look at a recent custom pallet flow solution designed and tested in our in-house testing lab. The customer is a national foodservice distributor who needed a way to manage the storage and distribution of fluid-filled IBCs that allowed for safe and effective deep-lane storage and retrieval. 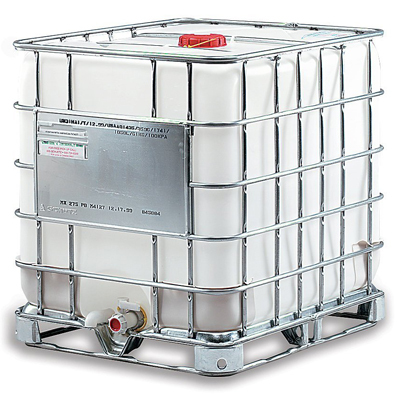 Filled IBCs – 40” x 48” x 46” approx. 2500-3000 lbs. Mallard’s experts first tested the IBCs alone, without the use of the slave pallet, and found the .86 diameter tubed bottom of the IBC only made contact with 7 rollers at a time. Minimal contact made it difficult to control the speed of flow using typical braking methods in a lane of three or more pallets. In a second test with the use of a slave pallet, they found that because of the superior contact of the pallet to the rollers, the IBC restarted well and flowed in a smoother and more fully controlled manner. For pallet flow lanes deeper than 3-deep, a slave pallet is recommended for safe and effective movement of bulk liquid storage IBCs. A full surface slave pallet will allow for ideal speed control and reliability. Do you have a challenging pallet flow project? Call our testing team – they’d LOVE to help find a solution.